Critics are apt to pitch their own shadows and find substance therein, but George Bernard Shaw saw As You Like It as a mere crowd pleaser, which exploited ‘the fondness of the British public for sham moralising and stage “philosophy”’. I have a confession to make. I have never been enamoured (give me a stately-written tragedy any day! I have always said) with As You Like It, never seconded its wit. Apart from the tantalising Marlovian allusions, I have always found it boring. I didn’t enjoy it when I studied it. I didn’t enjoy the Kenneth Branagh version. I didn’t enjoy the Basil Coleman version. In fact, before last night, it was my least favourite play by Shakespeare next to his collaboration with Fletcher on Henry VIII. And yet, the Rebecca Gould version allowed me to see why this play is so popular and beloved. I can honestly say that this was one of the most heart-warming, delightful theatre experiences I’ve ever had. It was the first time I’d attended the Everyman Open Air Festival, so it was all very new to me. The Bute Park trees screening the actors. The reds and blues contending in a summery evening sky. The tweeting of birds and the occasional barking of dogs. Here was an Arden or Arcadia, and the noise of traffic in the city seemed so very distant from this paradisiacal set. The audience were treated to a couple of hours in the golden world, and it was simply stunning. 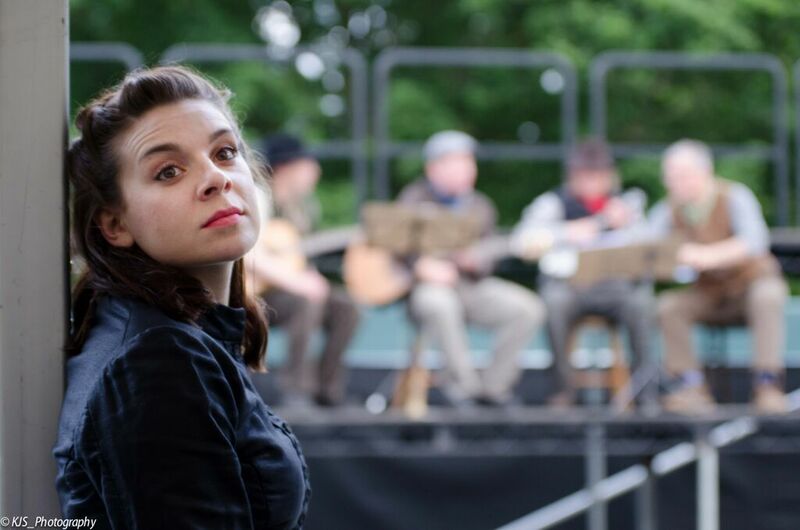 We were also treated to a few folk songs by a very talented group of musicians, before Rosalind (played by the captivating Bridie Smith) sealed the deal for me with a gorgeous rendition of ‘The Parting Glass’. This production is set pre-First World War. England represents the court and, I take it, rural Ireland is Arden. The business in England at the beginning of the play was hilarious. There was great chemistry between Smith’s Rosalind and Celia (played by the excellent Victoria Walters), and hilarious by-play between Orlando (Eifion Ap Cadno) and his brother Oliver (Ankur Senguptar). 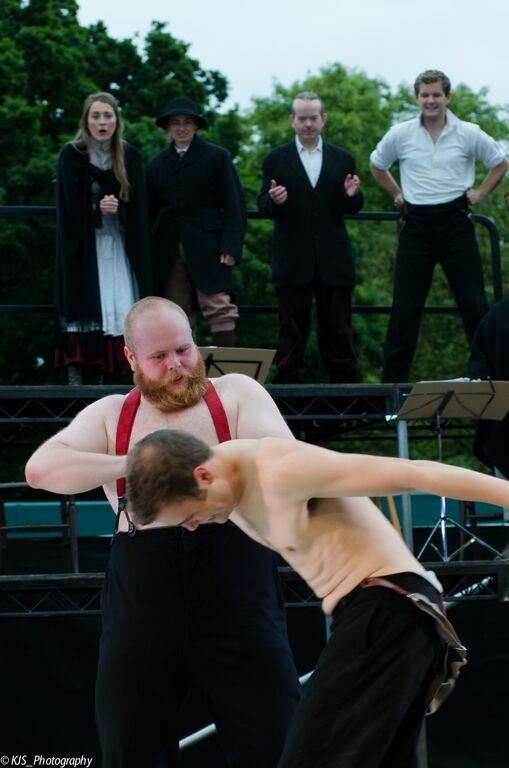 The audience were enthralled by the wrestling match between Orlando and the musclebound, rib-cracking Charles (Thomas Easton), and this made me realise that to truly appreciate Shakespeare’s comedy one must see it on stage. The actors were all smiles, and thus we were soon grinning too. When the players are clearly enjoying their roles in such a superbly directed production, it is a difficult thing to begrudge them of rapturous applause. We were soon banished to Arden, where we encountered all sorts of weird and wonderful characters. The interactions between the likes of Touchstone (played by Adam Porter, who is a particularly talented comic actor) and Audrey (Sophie Wilmot-Jackson), Silvius (Tom Lloyd-Kendall) and Phoebe (Charlotte Rees), never really appealed to me on the page. But given such strong casting and direction, the power of Shakespeare’s play to amuse shone as vivaciously as the final bursts of sunlight, before evening crept in and the stage lights illuminated the poem-pegged trees. Another positive reviewer has recently noted that the change of some male characters to female characters didn’t really add anything, nor take anything away. This would be my only criticism, if you can call it that. This reviewer also argued that audience participation was perhaps too far, but I strongly disagree. In this respect, Gould’s production was very faithful to Shakespeare’s original theatre and yet enabled audience members who might not be overly familiar with early modern drama to clap and stamp along with the exuberant actors. One can’t help being overawed by the talent that Everyman has at their disposal. I recently enjoyed a production of Measure for Measure at Chapter Theatre, and was stunned by the performances (although I was very upset to learn that some people seem to have radically misinterpreted a couple of lines of unadulterated praise in my review for that excellent production. ‘When a man’s verses’ etc. etc.). I was equally stunned by the cast of As You Like It. A special mention must go to the vocal talents of Ella Maxwell and Victoria Walters. One’s eye often scans over the page when a Shakespeare ditty comes up, but these guys modernised the songs and showed us why music is such an important component of Shakespearean comedy. Most importantly, perhaps, was the fact that the casting of the leads was really spot on. Eifion Ap Cadno made for a superb Orlando. He embraced the slapstick aspects of the play, but his performance was also understated. He made especially good use of his voice. When delivered by him, Shakespeare’s verse sounded like everyday conversation, and he dominated the stage with a starry presence that one can only envy. He has a big career ahead of him as a professional actor, I suspect. As for Bridie Smith, who I’ve never had the pleasure of seeing on stage before last night, I simply can’t praise her enough. I now realise why Rosalind is one of Shakespeare’s most beloved heroines. Smith had incredible energy and a real mastery of comic timing. I may be a bit biased, but Shakespeare’s language is at its most beautiful when delivered in the dulcet tones of a Welsh accent. Smith’s performance was quite possibly the finest female comedy performance I’ve ever had the pleasure of seeing on stage. Orlando and Rosalind were clearly enjoying the proceedings, and would be able to convince any Monsieur Melancholies that their love was genuine. 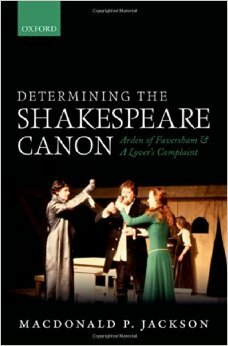 Review of MacDonald P. Jackson’s Monograph, Determining the Shakespeare Canon. My review of MacDonald P. Jackson’s monograph, Determining the Shakespeare Canon, is now available in Archiv fuer das Studium der Neueren Sprachen und Literaturen 252:1. More detailed evaluations of Jackson’s findings are forthcoming. You are currently browsing the Cardiff Shakespeare blog archives for July, 2015.